Posted on April 2, 2019 at 9:49 am. The Academy of American Poets founded National Poetry Month in April 1996 to celebrate “poetry’s vital place in our culture.” One of the primary goals of the month is to “highlight the extraordinary legacy and ongoing achievement of American poets.” Over the years, Poetry Month has become a huge literary observance with readers, students, teachers, librarians, booksellers, publishers, and poets from around the world participating in this month-long celebration in a whole host of different ways. Many special events and readings are scheduled to occur during April in honor of poetry. Over 100,000 National Poetry Month posters are distributed to schools, libraries, and bookstores each year. 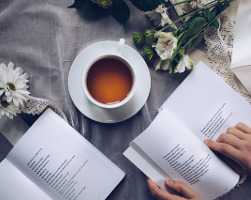 On April 18, poetry lovers are encouraged to participate in “Poem in Your Pocket Day.” On this day, select a poem, carry it with you, and share it with others wherever you go! To find out more about National Poetry Month, check out poets.org. And go to the WU Reads Reading Guide for an interesting selection of recent books of poetry available in our collection.